Canadian Maritimes cruises have sometimes been labeled as only for seniors or fall leaf-peeping aficionados, but that's definitely not the case. These cruises through Canada and New England offer tons of fun for multigenerational families, particularly if they choose the right ship. In addition, the ports of call on this itinerary offer exciting excursions appealing to all interests and age groups, making this a great itinerary for family reunions and celebratory events. Two Holland America Line ships, the ms Veendam and the ms Maasdam, sail from Boston, Montreal and Quebec City on 7-night cruises from May through October. Holland America�s innovative itineraries have been named �Best in Canada and New England� by Porthole Cruise Magazine readers. This New England/Canada itinerary is popular with other cruise lines as well. The Carnival Glory, for example, sails from New York City on 4-, 5- and 7-night Canada/New England voyages. Fall and leaf-peeping season draws a number of other cruise lines to this route, including Norwegian Cruise Line, Princess Cruises and Royal Caribbean. When considering a Canadian Maritimes multigenerational cruise, choose a ship that effectively caters to all age groups. Holland America�s ms Veendam, for example, is a superb choice for multigenerational families. The 1,266-passenger ms Veendam is a mid-sized ship with high intensity entertainment areas as well as quiet spots for relaxing and taking in tranquil sea views, such as the spacious Explorations Caf�. The ship sails from Boston and Quebec City on seven-night itineraries from late spring through fall, visiting the coastal ports of Charlottetown, Sydney, Halifax and Bar Harbor. 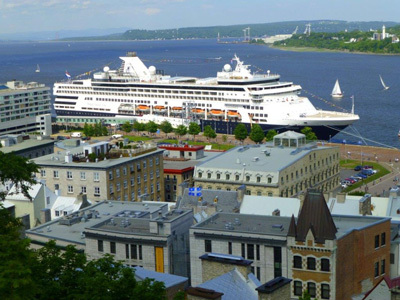 In addition, the ms Veendam overnights in Quebec City as part of its cruise itinerary, allowing families extra time to explore the sights of this magical spot. 1. Natural Wonders. Canada and New England ports are loaded with stunning sights. Located just a few miles from Quebec City, massive Montmorency Falls towers almost one hundred feet higher than Niagara Falls. Adventure-loving families can walk across the suspension bridge above the falls to look down over the torrential waters or take the aerial tram for a superb view. Other favorite spots include Cape Breton�s Bras D�Or Lakes and Maine�s Acadia National Park. If your ship calls in Saint John, try to visit the Bay of Fundy. With a tidal range of up to 53 feet and the highest tides in the world, Nova Scotia�s Bay of Fundy truly is a natural wonder. See the reversing rapids that are created when the Bay of Fundy�s high tides meet the Saint John�s River, or if you�re visiting the Bay when the tide is out, walk along the ocean floor and see what sea creatures can be found. 2. Extensive Opportunities for Learning. Ports such as Quebec City, Halifax, Charlottetown, Sydney and Bar Harbor cater to families with a wealth of activities. Families can visit Halifax's Discovery Centre and the Museum of Natural History filled with fossils and artifacts. Adults and kids alike will enjoy visiting the fortified town of Louisbourg, particularly this year during its 300-year anniversary celebration. Here, families can see soldiers and townspeople in 18th century garb, watch bread being made, and learn about the fishing industry. Highland Village, a living museum celebrating Gaelic heritage on Cape Breton Island, is another fascinating spot for learning. Bar Harbor�s Lulu Lobster Boat also gets rave reviews from families for combining education with entertainment. 3. Active Adventures. Many families enjoy hiking, biking, kayaking and other outdoor activities. Canada and New England ports feature all this and more. Families can take a bicycle adventure to Montmorency Falls outside Quebec City, sail around Cape Breton�s Bras D�Or Lakes, go kayaking in Halifax, and take a hike along the beautiful Ocean Trail in Maine�s Acadia National Park. Check your ship�s list of shore excursions as well as each port�s website for ideas and suggested activities. 4. European Flair. Parents often want to take their kids to Europe, but can be discouraged by staggeringly high airfare prices and long flight times. Canadian Maritimes ports provide some of the same European experiences, minus the wallet shock and jet lag. Kids can practice their French while touring in Montreal and Quebec City. Strolling around Quebec City feels a bit like being in Paris. Make sure to sample French crepes and croissants and enjoy a meal in an outdoor caf�. While Nova Scotia�s first successful European settlement was French, many Gaelic-speaking Scottish settlers came to Nova Scotia in the mid- to late 1700�s. The name Nova Scotia means �New Scotland�, and there are still Gaelic speaking residents in Nova Scotia to this day. 5. Awesome Kids & Teens Programs. The most successful multigenerational family vacations take place when kids and teens are happy and engaged. Many cruise lines know how to cater to families with programs and amenities. If you�re planning a multigenerational Canada/New England cruise, it�s important to select a ship that meets the needs of younger family members as well as parents and grandparents. Holland America�s ms Veendam, for example, caters to children with its Club HAL program and youth lounges. Club HAL is divided into two separate age groups: kids 3-7 and 8-12. The Loft and The Oasis, a private sun deck just for teens, provide cool enclaves for teens ages 13-17 to hang out, play video games, and enjoy lots of counselor-supervised activities. 6. Cooler Temperatures. Heading north to Canada and New England is the perfect way to avoid summer�s sweltering temperatures. Canadian ports are known for their changeable weather, but summer temperatures tend to average around 65-70 degrees Fahrenheit during the day as compared to triple digits in some parts of the United States. Before departing, make sure to check the weather forecast for each of your ports of call and pack accordingly. 7. Great Multigenerational Entertainment. Families often focus on their cruise ships for bulk of their multigenerational entertainment. On a Canada/New England cruise, however, even the ports get into the act. Many grandparents have shared their love of L.M. Montgomery�s Anne of Green Gables book series with their children and grandchildren. Multigenerational families visiting Prince Edward Island will enjoy visiting the Green Gables homestead together and sampling a raspberry cordial or two. When planning a multigenerational cruise, choose a ship that offers activities, shows and entertainment that appeals to all age groups. Holland America Line�s program of activities addresses a wide range of interests. Its Dancing with the Stars: At Sea program has proven to be particularly popular. Canada/New England cruises provide visually rich and memorable vacations, full of experiences that will last a lifetime. To see more of a Canada/New England cruise through pictures, check out this Pinterest collection. For more information on Holland America Line�s Canada/New England cruises, visit Hollandamerica.com. �Copyright 2013. The Beacon Group, Inc. All Rights Reserved.